You could be forgiven for thinking I was in the country and not in the centre of a city of nearly 8 million people. 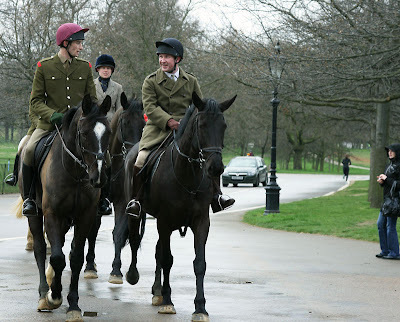 Horse riding, sports and protests all part of a weekend's activities in Hyde Park. It all looks very wet and bleak still. No for much longer though I guess. Many thank for putting me in touch with Stockholm. I am looking forward to joining the group come the middle of April. You always see horses in hyde park, and I am wondering if people can pay for a ride...if you can I HAVE to do that this summer! With each of your pictures, I tell myself someday I will get to see it all for myself. I love the fact that you are in the middle of a city! The picture is calm and I hope it stays that way for everyone there! And thanks for these pictures everyday, I love London. I stumbled across your blog, and I love it! I studied abroad in London for a few months in 2008, and I've missed it ever since. My favorite park would have to be Regent's Park, because you truly forget you're in the middle of the biggest city in Europe when you walk along in the gardens. I love these contrasting aspects of London life. You shouldn't be surprised of anything in London! have a nice week. Ciao. A.
I was wondering, though, who picks up the you-know-what after the horses trot on by? Very nice scene! They do have interesting outfits on. Yes, at first glance, I thought it was at the countryside; then i read your note. Very expressive moment and nice composition you captured here, Mo.